Just One Dollar Invested on 9lessons. I received lot of email questions from my readers that asked to me how much you paying for hosting?, where you hosted?, what is your bandwidth limit? like that. So today I want to answer all the questions. I had invested only one dollar for domain name 9lessons.info at Godaddy. My blog powered by blogger.com. I had customized blogger template. 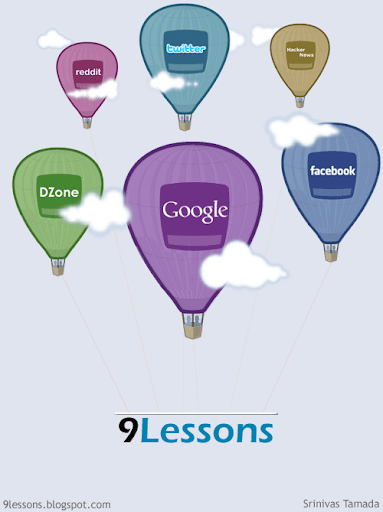 9lessons.blogspot.com publishing custom domain to www.9lessons.info. You can notice details on following image. And finally Godaddy here I had invested one dollar for domain. Total DNS Control and CName record setting you can see the below image sub domains connecting to particular servers. Big thanks to Google.com, blogger.com and 000webhost.com. So friends use the web resource. That's really interesting. I think most of people who are familiar with tech could invest only 1$ like you. However, for others who need support, they will need to invest more than that. hi thanx for sharing these infos.. may be very useful for starters. tell me one thing please are you using the free hosting of 000webhost.com ? If yes then is it okey? So nice to share all these things to all. Amazing your information with images.we understand quickly in images what you saying. How did you get that idea to explain in particular images?. in your post generating traffic in images very good idea to explain which way you get traffic. Yeah, 1 dollar but how much time you spend to writing tutorials? but now i can't put google ads on my blog , because google band my blog for dispaly ads. if i bought new domain from google and redirect it with my blog , will ads back to appear ? wow...its amazing...you are doing a great job...what average traffic do you get every day? This very great for invested just 1$, that inspired dude. thanks for that. another question, how much money you make from this blog? Gr8...so this EggLabs is your initiative?? But i m confused...is it 100,000 rupees/month or since you started the blog ??? Maybe it can support u..
Wow it's very helpful to us don't have yet budget.. I want to know how you manage your google adsense and other ads with different domain(from blogspot to 9lessons.info)? hi srinivas. Could you tell me how did you add cname records for demo and touch. 000webhost.com only supports NS i think. Can u write a tutorials about DNS management plz. Hey,I have started a website too.Can you help me as to how I can earn,what exactly should I do? Thanks for this post! I was wondering how to get sub domains! I too have a domain and i wanted to get sub domains like this! u r the only one role model for new bloggers. How much do you earn right now from your blog? You could also give the name Tech lab. Why egg lab.